Google's first push into the living room was a bit of an embarrassing misstep for the company behind Android, as its Nexus Q ended up vaporizing nearly as soon as it was launched. But Google wasn't about to let an early defeat get it down, and it was quick to follow that up with the extremely successful Chromecast. In the fall of 2014, the company tried the set-top-box angle again, this time introducing the Nexus Player with Android TV. The box offered a slick interface and solid streaming options, while adding a gaming component that went beyond simple Chromecast functionality. Now after a year and a half in the Google Store, it looks like the Nexus Player has hit the end of the line, as Google removes its product listing. For the moment, that leaves NVIDIA's Shield box as the only Android TV device available from Google. Other hardware like the Mi Box from Xiaomi is on the horizon, and manufacturers are building Android TV into more and more TVs themselves, but the retirement of the Nexus Player removes an important affordable option from the current Android TV lineup. Just because Google's putting an end to sales of the Nexus Player doesn't mean that support is going away, and not only does the Nexus Player continue to receive the latest Android platform updates, but it even has access to the in-development Android N preview. That's not a situation we expect to see change overnight, and while the Nexus Player will eventually be left behind the tide of progress, for now it's still young enough that software support can be relied upon. What's next for Google's Android TV efforts? Will the platform be dominated by third-party hardware for the foreseeable future? If it were a few weeks back, we might expect this move to be a sign that a new Nexus Player was about to launch at Google I/O, but with the conference now behind us, we're uncertain just what the future might hold for Google's set-top-box business. Did they ever advertise this? I don't recognize this device at all. T-MO really ? Just use Doutche-Telekom instead. It was a legitimate question. Thanks for the reply I suppose. I don't recognize it either lol, I was under the impression that Nvidia's shield box was the only android TV device. 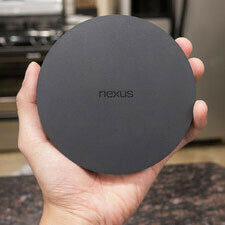 The Nexus Player was advertised a lot. Lots of articles on here and android central. The device is DOA. Come with a weak processor and 1GB ram. Completely destroy any gaming potential. Even Apple give priority to their TV box CPU and RAM making it run all their game smoothly. They didn't advertise it at all but if you visited any Android website regularly during the past year you would have come across an article about it. I love mine... Storage is a little low, but i feel like there's a way that it can be expanded. I picked one of these up at target for $19 when they were getting rid of them. I immediately put Kodi on there and I made my dumb tv smart!! The best thing I like about it is talking into the remote and voice searching for things. I would have bought all of them at $19 a piece. Damn! With the Apple TV and the Roku, Goofle didn't have a chance with the Nexus Player.